Have you ever heard someone say: I’m not sure if I should do RCM, FMEA, FMECA, or CBM? But that leads me to one of the biggest misconceptions of the RCM process. It’s often wrongly believed that Reliability Centered Maintenance (RCM), Failure Modes and Effects Analysis, (FMEA), Failure Modes, Effects, and Criticality Analysis (FMECA) and Condition Based Maintenance (CBM) are independent processes. Let’s start with FMEA. As shown below, the four steps of the RCM process produce a FMEA. When you include step 5 of the RCM process – Failure Consequences – a FMECA is generated. So, when you do RCM, the requirement for a FMEA and a FMECA is largely satisfied. Now let’s move on to CBM. 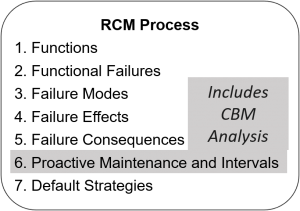 Step 6 of the RCM process, Proactive Maintenance and Intervals, embodies the CBM process. Therefore, if RCM is properly carried out, CBM is accomplished as a natural order of course. 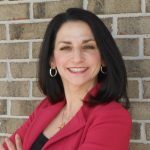 FMEA, FMECA, and CBM…when you do RCM, you do ‘em all. And don’t let anyone else tell you differently! ← How are spare parts handled within the Reliability Centered Maintenance (RCM) process?